Safely clean virtually any marine surface! Marine 31 Port to Starboard All Purpose Cleaner is a biodegradable marine cleaner that encapsulates dirt and grime, leaving marine surfaces clean and fresh. Safe for virtually any surface, Marine 31 Port to Starboard All Purpose Cleaner can be used to remove black streaks, mildew, and other common stains that are found in the marine environment. Concentrated formula dilutes according to specific jobs � vinyl, carpet, upholstery, and more! Marine 31 Port to Starboard All Purpose Cleaner is tough on grime but safe for the environment. 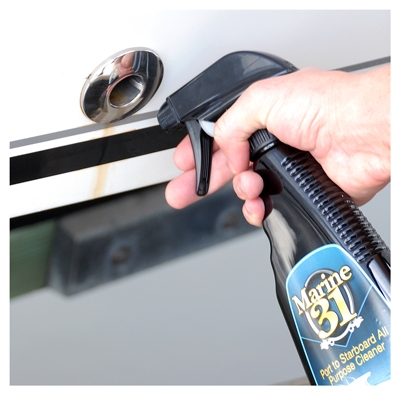 Use Marine 31 Port to Starboard All Purpose Cleaner to remove salt and mildew stains from gel coat, drink spills from vinyl and clean virtually any other surface of your boat that gets dirty from every day use. Concentrated formula dilutes accordingly to specific cleaning tasks; use full strength for mildew or dilute 1:10 (cleaner/water) for carpet and upholstery. Marine 31 Port to Starboard All Purpose Cleaner works on vinyl, fabric, rubber, fiberglass, upholstery, inflatable boats, sailboat dodgers, boat covers, decks and more! If it�s dirty, Marine 31 Port to Starboard All Purpose Cleaner will make it clean once again! Marine 31 Port to Starboard All Purpose Cleaner is harbor-safe and eco-friendly. Always test on inconspicuous area to ensure compatibility. For heavily soiled surfaces, use full strength. Agitate with a towel or brush if needed. Rinse thoroughly or wipe surface with a damp microfiber towel. For light duty cleaning, dilute 1 part concentrate to 5 parts water. For carpet and upholstery, dilute 1 part concentrate to 10 parts water. Not very impressed with this product. Having had such great success with the mildew remover, I was excited to try this on some stubborn stains. Unfortunately, the result were just okay. Not worth the cost.